On November 8, the Lord told me that the spiritual season had shifted and we are now in an Isaiah 54 season of expansion. 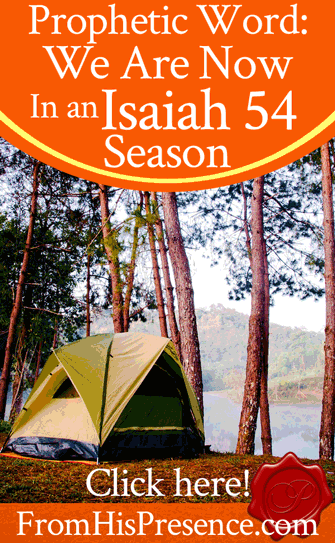 What does the Isaiah 54 season mean? Five things–and I am already seeing these five things manifest. If you look around you, chances are that you are too! Sing, O barren, you who have not borne! Break forth into singing, and cry aloud, you who have not labored with child! For more are the children of the desolate than the children of the married woman,’ says the Lord. ‘Enlarge the place of your tent, and let them stretch out the curtains of your dwellings; do not spare; lengthen your cords, and strengthen your stakes. He emphasized this word “reprehensible” in my hearing. God made us to be a flock, and a flock is supposed to hang together. If we were hanging together like we should, none of God’s people would be desolate. The example the Lord showed me of fixing and healing someone’s desolation was that of Leah and Rachel, Jacob’s two wives. Then Jacob also went in to Rachel, and he also loved Rachel more than Leah. And he served with Laban still another seven years. When God saw Leah’s plight, He opened her womb … over and over. He made her fruitful in her place of emotional barrenness. He gave Leah more children because she was hated in comparison to her sister. 2. The Lord told me it is also time to enlarge the place of your tent, and to “let them” stretch out the curtains of your dwellings. Notice that Isaiah 54:2 says to “let them” stretch out the curtains of your dwellings. Let them. Who is “them”? Other people. Christians in general already understand that we are called to serve and help a greater vision. However, we have too often lost the understanding that Father also desires to send people alongside each of us to help US. I believe that you need to ask God right now–and every day going forward–to send the people to you who are supposed to come alongside you and help you. I began praying that particular prayer a few months ago, and within about three days God sent me two translators–one native Spanish-speaker and one native French-speaker–who volunteered to help me translate this blog for free. I offered to pay them, but they would not accept payment. They said they simply wanted to help. It was a direct answer to my prayer. So in this Isaiah 54 season, ask Father to send you the people whom He wants to come alongside you to help you with your mission! Father God has enough “cookies”–good things–for all His children. And His government and Kingdom are continually advancing. He is continually taking new territory through you. He is continually using you to do more for Him. He is continually enlarging His government in your heart. Believe that He really is advancing you. Steward everything He gives you diligently, even if it seems small at first. Don’t despise the day of small beginnings. Go after everything He tells you to do with all your heart. When we come to Father with our requests, prayers, and petitions, He is willing. In Matthew 8:3, Jesus actually disclosed this as His personal name. Whenever we see God say “I am ____” in the Bible, pay attention. He is disclosing His own name when He does that; He is telling us about an aspect of His nature that was often not previously known to us. In Matthew 8:3, Jesus disclosed His name as “I Am Willing.” What do you need from Him? He is willing. In this season, we are to get to know Him by this name. “You have not because you ask not.” What’s the obvious solution to this? Start asking! Personally, every time I have taken a step of faith to advance my work for the Kingdom, God has come up under me and has provided for the fulfillment of that work. He has backed up the step of faith after it was taken, every time. HOWEVER: In every situation, I had to take the step of faith first. Friends, it’s a new season. God is moving in a new way to advance and honor His children. Will you cooperate with Him so you can see more of His advancement in your own life? If you will, I believe you’ll be amazed beyond your wildest dreams. Does this word speak to your heart today? If so, please leave a comment below! I’d love to hear from you! P.S. Would you help me with my work of reaching people for Jesus as a domestic missionary? This blog, and all of my mission work in person, are made possible through your partnerships, donations, and product purchases. This is such a Rhema Word!!! It is also confirmation as my pastor spoke on this yesterday (Sunday). He prophesied that there would be promotions and wealth transfers. He also spoke on using what we already have to step out and advance. I just want it plainly revealed to me all the God-given gifts(tools) that the Lord has given me, so that I can use them. I want to be used up by Christ. I don’t want any gift to lay dormant. I need revelation from the Holy Spirit. Please keep me in prayer that my ears, heart, mind,soul and spirit are alert to hear and respond appropriately to the Holy Spirit’s revelation. Amen and amen and amen! The Lion of Judah is roaring over His people. It’s so exciting! So glad this is confirmation for you! I’d be happy to pray for you, and I’d encourage you to just use today whatever gifts you know you have. As you steward whatever you already know about in any way you can, Father will show you more and more! Stewarding what you have acts like a floodgate! Thank you so much for your words, I sat my 16yr old while I read your blog and expressed to her how important it is for her to put God first before anything else so she can understand and appreciate all his promises for us. How important it is to pray together. Where he tells us where there are two in prayer, I will be there – no that he isn’t there when I pray on my own but it’s such a stronger bond when together. He has shown us so much and we are so much more grateful for his word and love for us. We are currently going through a rough time and your words were a confirmation along with other occurrences this past week. I know things like this don’t happen by coincidence and he leads our paths – so please keep my family and I in prayer. Thanks again and God Bless! Yes! Thank You, I Am Willing! Received and by faith, stepping forward as You direct. Amen! As always, your blog is used by God for a mighty ministry to my heart. Ironically, I heard God telling me to fast, starting Sunday after church…I dismissed it, because I didn’t have a specific thing to pray over…but, God didn’t take my “no”. By 4:30, I was super nauseous and could not eat. Then He reminded me that it was not a random thought, that He was prompting me to fast and to pray for the next 3 days. So, I am obediently fasting, praying over several situations and people in my life, and just leaving it open to what He directs me to pray about. God has also been bringing me Isaiah 54 in my quiet times with Him. I believe that God has used your blog to confirm what He has already put in my heart. I am praying for a mighty expansion of your household, and of your ministries as well! Hey Kristi, that’s pretty freaky. In a totally awesome way. 🙂 Thank you so much for sharing. I pray that, as you fast, Father God would show you the most amazing answers to prayer that will fire you up, encourage you, and overwhelm you with joy. In Jesus’ name! Glory be to God for blessing you. Asking ‘them’ to help you with your translation. I pray that the same anointing will be seen in me as I am walking in faith for all my wishes and dreams to be fulfilled asPapa ha promised. God bless you. Amen! I agree with your prayer for you as well! Loved it & one of the promises I have believed God for all through to vs 17. Thank you much! Amen. I love that whole chapter as well. So powerful and encouraging. I woke up this morning hearing God saying read Isaiah. Wow the open my email up to this word that God have you and it is isaiah. I receive it Amen!! I used to be tricked by that poverty spirit. Not anymore! And I know He is willing, I never thought about it being His name. Stay on your guard, sis! Sometimes that thing tries to sneak back in in unexpected ways. We must be sober and watchful. 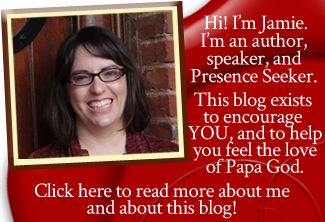 This blog rocks , Jamie ! I was made to believe that poverty is a good for a Christian. But I can see clearly it is not. What a relief and enlighten! There is so much beauty in Isaiah 54. Hey Nicola. No, poverty definitely is NOT good for a Christian. In the Bible, poverty is always a curse; never a blessing. So we in the Church have got to come up to God’s definition of being blessed!!! I’m so glad it encouraged you, Millie! Thank you for letting me know! Have a wonderful weekend! Hi Jamie, I have been getting the same as well about expansion, also advancing. I just gave a teaching at our women’s ministry night on 1 Corinthians 12, how every part matters. The dual responsibility of knowing we are called by God and matter, but also knowing that we have to do our part to come alongside and help each others as well. The Pastor did not know the Lord gave me this teaching weeks before and preached on it 2 nights before the ministry night. I shared with him the Holy Spirit gave the exact same word and we laughed at the goodness of God to confirm but also realized this is a Word He is trying to get to the church! I also want to share that I did this prayer for help and got a phone call in the middle of writing this comment and it turned into a divine connection for help! Glory to God! Sybella, that is really, really cool about how you and your pastor heard the same word at the same time. That’s confirmation you are hearing God well! And sooooo cool about how God sent you help so quickly! I love it when He does that. He’s so yummy. Thank You, Father! Hi i just received your prophetic word that you received. Wow God is good. I need prayer for healing i am on antidepressant and anxiety meditation. I am not sure what i am suffering from whether it is anxiety or menopause or both. I wanted someone to agree with me as i am the only person in my house who prays. No one understands in my home what i am going through. How can i use the prophesy for asking for healing. I want to do God’s work and help people who are going through the same thing. And i want all the glory to go to God. Also please pray for doubt to leave me. Can you please reply to me personally i will really appreciate it . And i will support your ministry if you could send me banking details. Thank you. God bless you ? for your wonderful work that you are doing. Hi Shanu. Thank you again for reading. I just prayed for you. Thank you for reading my blog. If you would like to partner with me, I would certainly love to have your help! I can’t do what I do to reach people without our entire community of people who help. You can go here to sign up for my partnership program. Thank you so much for your support, and thank you for sharing! (I posted this in the wrong spot-I apologize for that))Thank you so much for your words, I sat my 16yr old while I read your blog and expressed to her how important it is for her to put God first before anything else so she can understand and appreciate all his promises for us. How important it is to pray together. Where he tells us where there are two in prayer, I will be there – no that he isn’t there when I pray on my own but it’s such a stronger bond when together. He has shown us so much and we are so much more grateful for his word and love for us. We are currently going through a rough time and your words were a confirmation along with other occurrences this past week. I know things like this don’t happen by coincidence and he leads our paths – so please keep my family and I in prayer. Thanks again and God Bless! I was truly blessed and refreshed by this awesome word today. God spoke to me clearly and reminded me that He has not forgotten about me. I just recently read about Rachel and Leah and so that was confirmation that I am studying where God has led me to study. I pray that God will continue to bless and supply you with whatever you need to continue building His Kingdom. Thank You for your obedience. Read this and cried today. Your word was right on time. I’m excited about this time in history. It will be the greatest time we’ve ever known. As a prophetess I told churches this time was coming about 10 years ago and now that it’s here, I’m too excited! I just posted in Facebook yesterday, the key to God manifesting our miracles and turnarounds, is praise. What he’s promised, he’s ready to do. Keep doing what you’re doing. You’re a blessing. Rhema! I am willing and I receive. Yesterday Papa gave me a vision that was way way out there! I’m a lady of maturing age and in the vision I was lactating sweet milk. You probably fully understand the full sensation and leaking that I was feeling. He spoke to me to rest until the fullness comes. How uncomfortable that rest can be without the knowledge that the fullness will nurture and fortify our child. I had been praying for children, The church and the teachers (pasters, teachers, evangelist, you and those who spread the gospel) . Our community just experienced the horrible tragedy of a high school shooting and Father gave me a heart for the shooter who has been abused and bullied at home and school most of his 15 years. He has never felt love ever! While not a very popular person i must stand for the child within this young man. How it relates to this vision I am unclear but praying for understanding as well. This vision through prayer aligns with what you are being led to share. A pouring out, a nurturing, a window opening from heaven. We only share our milk with the ones we love the most who is given of our own image or to the child needing nutrients as in the case of surrogacy. Our beloved children! We are His children, we are His beloved and He is our Father, our Giver of life and nutrition. I am willing and I receive these words in the beautiful fortifying nurturing name of Jesus. Jamie, I thank you for this word today. I know something good is going to happen to me and my family this yr. 2018 I am clamming it. God is really using you. I am so glad he answer your prayer about a baby. God is so good. Please keep me and my family in prayer. I thank you again Be bless. This is surely a confirmation for me too. He’s been whispering Isaiah 54:2 to me for the past week, which is a time we have been waiting for for 5 years since He promised me in a vision that He was being our family to “perfection/conpletion.” I wait in joyful hope for its fulfillment. God has given me this whole chapter for Isaiah 54 as promise for me last year, but I believe and consider your article as reconfirmation of the word. This article comes at the most needed hour. I thank the ALmighty for giving these words to you and helping me to subscribe to you blog. Thank you Jamie. God bless you, Elijah, family and your ministry. Jamie I came across your blog as I was looking up these verses for an annual report I am preparing. What an encouragement! Years ago when i first started following Christ, God impressed this verse upon my heart through the Prayer of Jabez booklet. This past year as God called me into new ministry territory with Key Bible Clubs He reminded me of this call and promise. It has been the message He’s had me speak as I go into churches and share about the need to reach children in schools with the gospel as they have now become the largest unreached people group, but they are also the most receptive to the gospel and God wants us to go to them..He is calling on His church to rescue them and He will take back those cities (and schools) that were once destroyed. Wonderful! Welcome to our community, Vicky!